Need a summer project? 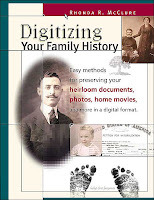 How about organizing your boxes of family photos? Put them in albums and label them on the back (no.2 pencil only), so that future generations can identify the strange people with the hula hoops, and those in funky prom dresses. 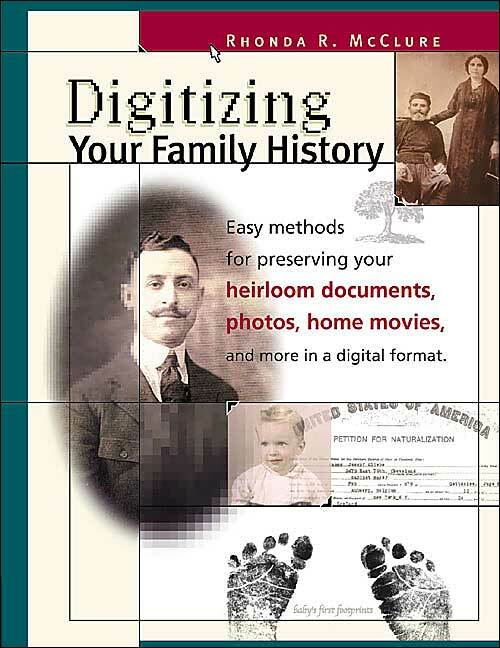 If you want to organize and then preserve your photos digitally, then look for Digitizing Your Family History: Easy Methods for Preserving Your Heirloom Documents, Photos, Home Movies and More in a Digital Format by Rhonda R. McClure [929.1 MCC]. You could make your photos available to family and friends by putting them online at a photo sharing site such as flickr, on Facebook, or on a blog. My preference would be blogging, since it gives you opportunity to fully explain your photos, relationships, family events, etc., and allows for comments. I found a blog that does exactly this, it's called Pieces of the Past (I have no connection to the blog, it is one I stumbled upon and thought, Hey, what a great idea!) 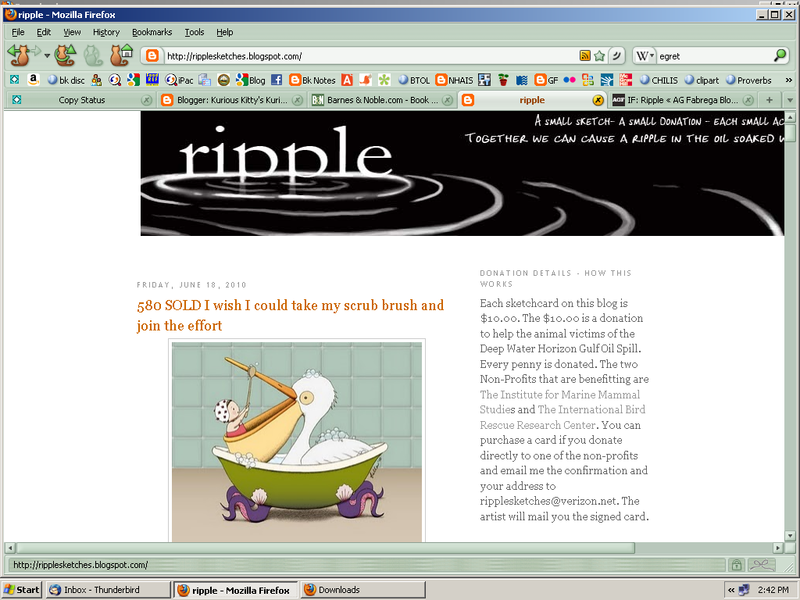 There are a number of free blog sites, but, I recommend Blogger, since it is the one I use, and am most familiar with. A little time spent on this summer project will make future generations of your family very grateful. One way to keep your kids occupied on a rainy summer day is to work with them on a Lego project. Imagination is usually enough to get a kid started, but, adults often need a jumpstart. Borrow the library's copy of Build Amazing Animals [J 688.725 BUI] or Cool Cars and Trucks by Sean Kenney [J 730.92 KEN], and you'll have enough to inspire you for many rainy days. 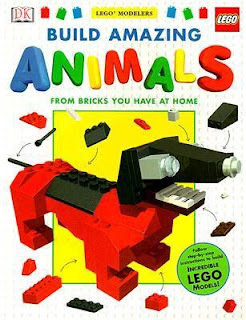 If you want to aspire to a higher Lego building experience visit this page on the DIYLife website and you'll find links to projects for everything from a desk to a trebuchet! How awesome is that? For even more inspiration, listen to this report from NPR about the Cleveland Indians' assistant clubhouse manager, Wayne Peltz, and what he does with Legos. I don't think anyone needs an excuse for a party in the summer--just celebrate good weather and good friends! One fun summer party theme is "Tiki" or "Luau." Party stores stock up on these types of party decorations each summer. Party ideas can be found in books such as The Party Girl Cookbook by Nina Lesowitiz [642.4 LES]. 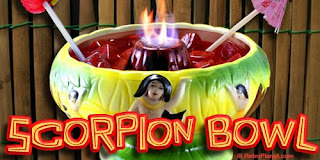 And, to make it extra special try a few Tiki bar drinks. Other drinks recipes can be found in 101 Sangrias & Pitcher Drinks by Kim Haasarud [641.874 HAA] and Coolers and Summer Cocktails by Elsa Petersen-Schepelern [641.2 PET]. In Quiet Light: Poems on Vermeer's Women by Marilyn McEntyre [811.6 MCE] is a book of poetry devoted entirely to the paintings of Vermeer. 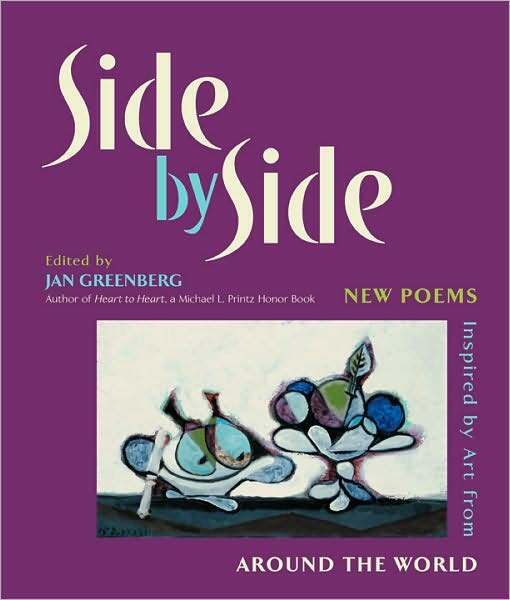 Another book of ekphrastic poems is Side by Side: New Poems Inspired by Art from around the World edited by Jan Greenberg [YA 808.81 SID]. The book is unique in that not only does it pair poetry and art, it also includes poems written in languages other than English and has the poem appear both in the original, and in translation. 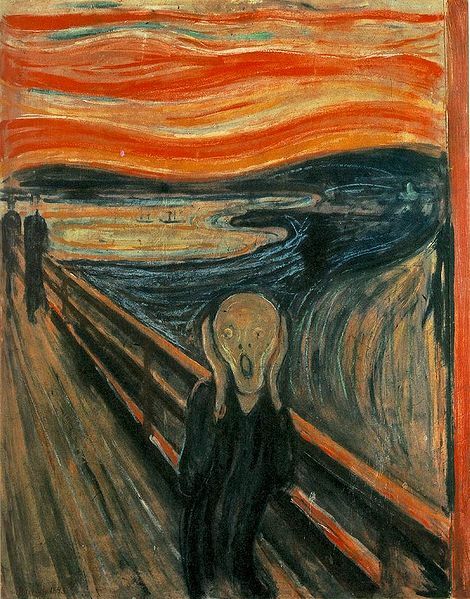 Since most everyone has seen Edvard Munch's painting, "The Scream," I'd like to share this poem from Side by Side by Gunter Kunert, translated from German by Gerald Chapple. view of our own character. 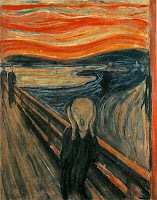 To learn more about ekphrastic poetry, visit Poets.org for an informative article with links to many examples. The Poetry Friday Round-Up for this week may be found at The Art of Irreverence hosted by Amy Graves, who also happens to be a New Hampshire librarian! The summer is a great time to wear a dress, especially if it's a light-weight cotton, and, is sleeveless. 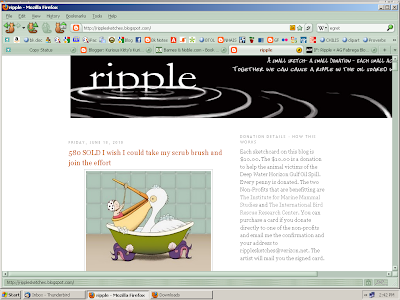 In looking at the art donated to Ripple, I came across one piece that piqued my interest. 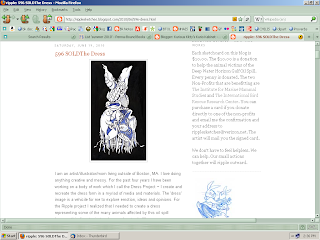 It was an illustration of a classic dress shape constructed of Gulf Coast marine life. I clicked on the website of the artist, Virginia Fitzgerald, and was amazed to find an array of dresses made from a variety unexpected materials such as plastic bottles and pebbles. You can also check out Fitzgerald's blog where she goes into detail about the thought processes behind her Gulf Coast dress. Quite coincidentally, I came across another blog where the poster had photographed a number of dresses she had made. The dresses are sugar cookies decorated with marshmallow fondant! The advice given to young women over the years is "you can't go wrong with a little black dress." 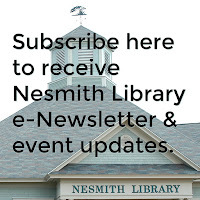 (Author Nancy MacDonnell Smith has written a book to explain the little black dress: The Classic Ten: The True Story of the Little Black Dress and Nine Other Fashion Favorites [391 MAC].) Perhaps nowadays, the advice should be updated to include "you can't go wrong with a dress as your inspiration for art." A new museum opened up three months ago in Washington, D.C. It's the German-American Heritage Museum. About 15 percent of Americans come from a German background. If you're one of them, you may be want to visit the museum on your next trip to D.C. 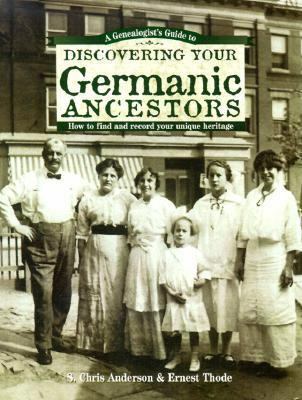 If you're of German-American heritage, you might be interested in tracing your Germanic roots. 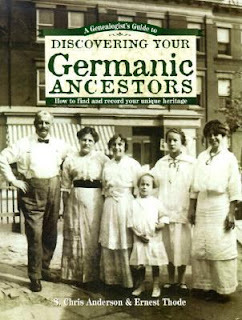 Here are two titles that will help: A Genealogist's Guide to Discovering Your Germanic Ancestors: How to Find and Record Your Unique Heritage by S. Chris Anderson [929 AND], or In Search of Your German Roots: A Complete Guide to Tracing Your Ancestors in the Germanic Areas of Europe by Angus Baxter [929 BAX]. Of course, if you're like me, you're an American mutt with a background that encompasses many nationalities. In that case, I'd recommend just browsing in the genealogy section, 929, to see what applies to you! 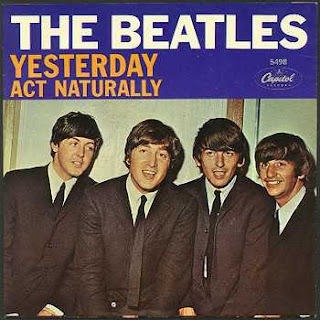 "Yesterday" originally appeared on the Beatles' 1965 record, Help! 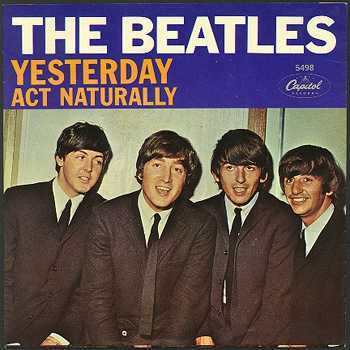 We don't have Help!, but we do have it on The Beatles 1962-1966 [CD ROCK BEA]. And, we also have cover versions on The Essential Chet Atkins [CD COUNTRY ATK] and Timeless: The Classics by Michael Bolton [CD MALE VOCALIST BOL]. Lucky for you, only those two came up on my first (and only) search! So, why is the title of this post, "Scrambled Eggs"? Click here. I don't imagine there are many people who are not upset by the disastrous oil spill and its effect on the flora and fauna of the Gulf Coast. Few of us, however, act on it. In an effort to help the wildlife of the Gulf Coast, an illustrator, Kelly Light, has set up a blog, Ripple, which is subtitled, "A small sketch--a small donation--each small act helps. Together we can cause a ripple in the oil soaked waters of the Gulf." Artists, illustrators, and graphic designers are donating tiny works of art to entice people to contribute to The Institute for Marine Mammal Studies and The International Bird Rescue Research Center. The details of the program are on the blog. The amazing part of this generous act is the response from artists. The art is coming from around the world--France, Japan, India, the United Kingdom, South Africa, Venezuela, Dubai, as well as the United States and Canada. 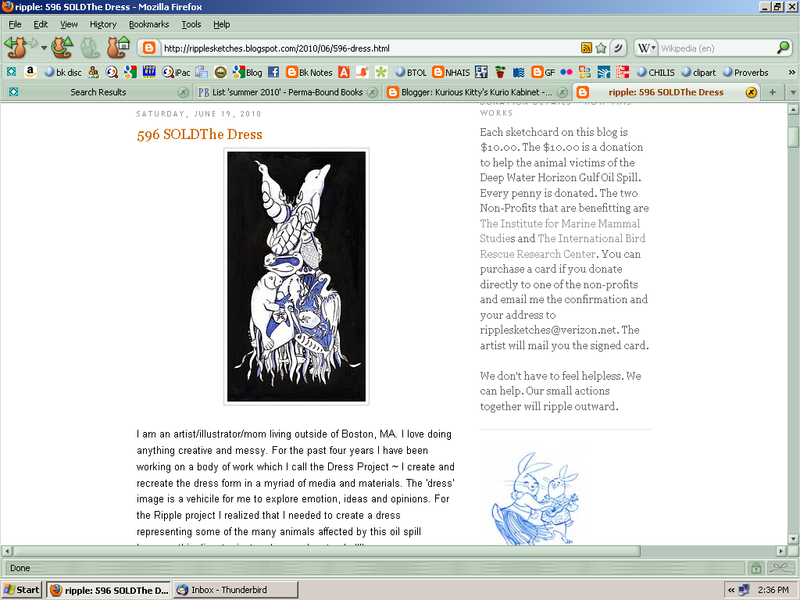 I saw about a dozen pieces from artists in New Hampshire! Bravo! Davis, Katie. Who Hops? [JP DAV]. Eldridge, Marion. 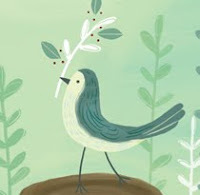 The Sparrow's Easter Song by Michelle Medlock Adams. [JP ADA]. I hope you'll all consider supporting the Ripple effort! 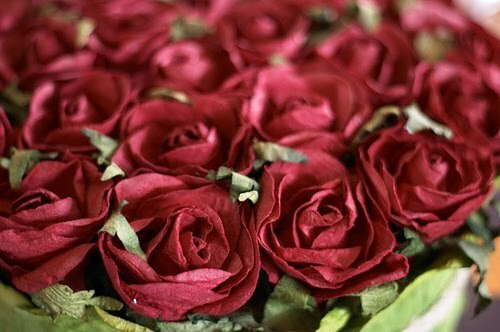 My favorite line is the chance of poetry, a chance/poetry gives passion to the roses. I like the touch of mystery. And, the feeling of latent malice. Levertov has given us a scene that is drawn so well and with an economy of words that is admirable. I'll have to look for more by Levertov! This week's Poetry Friday Round-Up is taking place at Two Writing Teachers. The United States has been late in coming to the sport of soccer, but kids have been playing the sport, on town teams and in school, for at least 25 years. As young soccer players grow up, they become soccer fans. This year interest in the World Cup has exploded. The best place to start looking for World Cup information is at the FIFA website. FIFA is the acronym for Fédération Internationale de Football Association. Team USA information can be found here and here. Visit either or both of our soccer collections in 796.334 and J 796.334. We also have several DVDs, such as Sigi Schmid's Offensive Soccer Tactics and Sigi Schmid's Defensive Soccer Tactics [both DVD 796.334 SCH]. And don't forget the fictional soccer films, Air Bud, World Pup [J DVD AIR], Bend It Like Beckham [DVD BEN], and The Cup [DVD CUP], just to name a few. Work of Art: The Next Great Artist will bring together fourteen aspiring artists to compete for a solo show at the prestigious Brooklyn Museum and a generous cash prize. Work of Art airs on Wednesday nights, so if your interest is piqued tune in tonight at 10:00 pm. And don't forget that we have passes to art museums, including the Currier in Manchester, where you can view the work of already established artists. Last week Stephanie Meyer's new book, The Short Second Life of Bree Tanner, was released in book form. We have it on order. I know there are some who are anxiously awaiting it, if you are one of those people, the novella is available online for you to read on your computer! For free! If you wish to read it online, you'd better hurry, it will only be available until July 5. Click here. If you're feeling altruistic, you may wish to purchase a hardcover copy. Meyer has designated $1. from each sale to go to the American Red Cross. If you haven't read the "Twilight" series yet, we have multiple copies of the first three books currently sitting on the shelves [YA MEY]! All copies of the last book are out, but, you can always put a hold on it. 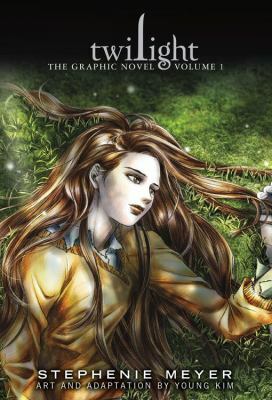 Recently, Twilight has been released in yet another format--graphic novel [YA CX MEY]. The adaptation and art are by Young Kim. Other books in the series will follow. Remember the "this is your brain on drugs" public service announcements? Well, pretty soon television stations may start running "this is your brain on electronic devices" announcements. Why? Because it seems that in our world of instant communications, we may actually be losing the ability to focus and communicate with real people! Or so says an article in the New York Times. New Hampshire is, and was, home to many poets of note. One, was Celia Thaxter. In the first sentence of her introduction to The Poems of Celia Thaxter [811 THA], Jane E. Vallier writes, "Celia Laighton Thaxter, the most widely published woman writing poetry in America in the last half of the nineteenth century, lived a life of mythic dimensions." Doesn't that draw you right in? Don't you want to learn more? If so, we have Jane E. Vallier's Poet on Demand: The Life, Letters, and Works of Celia Thaxter in our biography section [B THA]. Thaxter's work is a product of its time--largely overwrought rhyme, without much depth. But, that's not to say there is no value to it! As a matter of fact, if I were a teacher, I might use the following poem in a science unit on the chemistry of soil, or, one on color. I'm not a teacher, though, so I'll simply lead you to the poem and leave you to your own thoughts! Of the sweet pea's flight of flowers, of the nettle's sting. Out of this powder its strength and its toughness drew! The mulberry leaves should yield to the worm's slow toil. That grants to the grapevine juice that can madden or cheer? Where the lilies proud their blossoms pure uprear? Who shall compass or fathom God's thought profound? 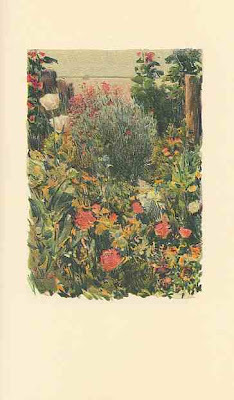 This poem is found in An Island Garden, illustrated by another NH notable, artist, Childe Hassam [635.9 THA]. 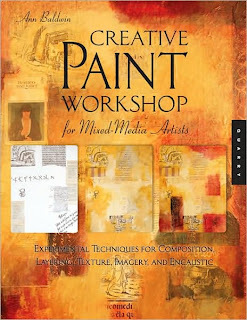 A digitized copy of the book is available online (complete with illustrations) from the University of Pennsylvania. The above-mentioned The Poems of Celia Thaxter [811 THA], also contains the poem, "Dust." Despite the inclusion of "Dust" in An Island Garden, Thaxter includes no other of her poems in the book. It is largely commentary on her garden--its layout, its flowers, and the non-human visitors to it. "All kinds of strange and remarkable creatures find their way here, and I am surprised at nothing." Make your way over to Kelly Polark's blog for this week's Poetry Friday Round-Up. Yesterday I was lucky enough to attend a program by writer/photographer, and NH resident, Paul Wainwright. 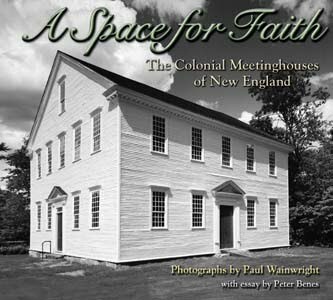 Wainwright recently published a book called A Space for Faith: The Colonial Meeting Houses of New England [726.5 WAI]. In colonial New England, there was little distinction between faith and community. Meetinghouses were built by the communities, usually but not always through taxation, and these were used for both religious worship and town business. They were the central focus of the community, and were an important point of contact for all. Also on the website is a 12-minute video produced by videographer Peter Hoving, a slideshow, and miscellaneous information about meetinghouses. A related book in our collection is Great New England Churches: 65 Houses of Worship That Changed Our Lives by Robert Mutrux [726 MUT]. Back in the olden days, when rich men sent their families off to the mountains for the summers, grand hotels were a big part of the New England scene. Few of these hotels remain. Many succumbed to fire, the rest to the end of the "privileged" class of society, and, to the invention of air conditioning! 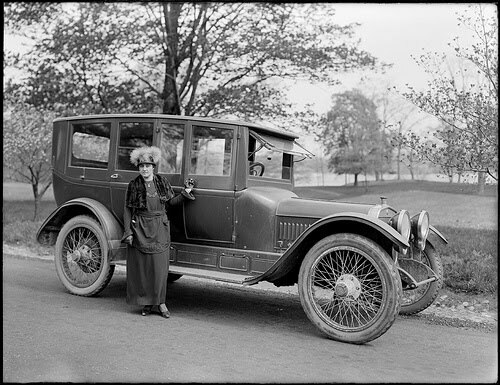 Here in New Hampshire we had a number of grand hotels, most being situated in the White Mountains. To look back at the era of NH's grand hotels and their clientele and workers, you need to borrow White Mountain Hotels, Inns, and Taverns by David Emerson [974.2 EME]. It is part of the "Images of America" series that nicely integrates old photos, postcards, with brief descriptions to give you a real sense of hotel living. 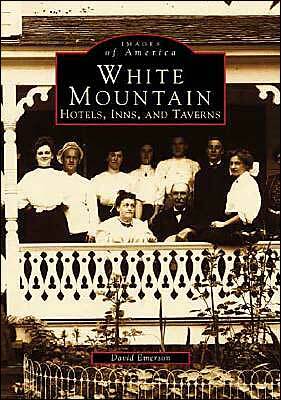 A more complete history of some of the White Mountain hotels is found in And Then There Was One: A History of the Hotels of the Summit and the West Side of Mt. Washington by George E. McAvoy [974.2 MCA]. The "one" that remains is the Omni Mount Washington Resort in Bretton Woods. It is still going and is now owned by the Omni chain of hotels. Where Are You Staying This Summer? It's too late to book a room in one of the shortest-lived hotels in the world, the Save the Beach Hotel in Rome. The hotel was open June 3-7, and, it only had 5 rooms! Even more astonishing is the fact that the hotel is made of trash--that's right, trash. It was built to highlight the damage done to beaches by the trash that is left on them. There's more information on the BBC news site, click here. I'm sure your vacation plans include establishments that are a little more conventional! 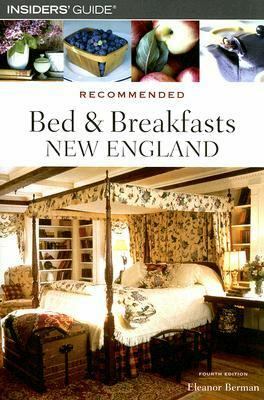 If you still haven't planned your summer vacation, come visit our travel section where you'll find books such as 239 Great Places to Escape to Nature without Roughing It [917.304 TWO] and Recommended Bed and Breakfasts: New England by Eleanor Berman [917.4 BER]. 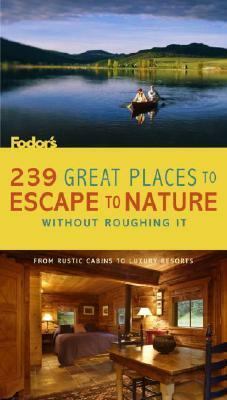 Or, if you're particularly environmentally conscious, you may wish to borrow Fodor's Green Travel: The World's Best Eco-Lodges & Earth-Friendly Hotels [917.46 FOD]. Wasn't that an amazing video! And we humans think we're adaptable--we're nothing compared to the cuttlefish! 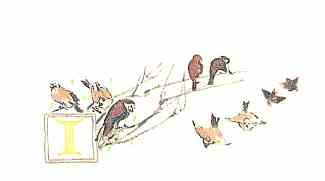 A collection of stories, poems, riddles, games, and hands-on activities focusing on the mathematical aspects of a trip to the zoo. Do monkeys tweet? Do pigs have stripes? A series of questions and bright, simple illustrations prompt readers and listeners to guess the answers. Poetry Friday--"Growing Stones in New Hampshire"
Anyone who has ever lived in New Hampshire will read Mekeel McBride's "Growing Stones in New Hampshire" and say, Ah, yes, that's the way it really is! for us--something neither of us had foreseen. for tomatoes, a boulder bigger than a sofa. "will be better. We'll build a fence. At least the stones are out." To read the rest, you'll have to borrow Dog Star Delicatessen: New and Selected Poems 1979-2006 [811.54 MCB]. If you'd like to read more of Ms. McBride's commentary on New England, visit her blog, Listening to the River. Check out this week's edition of the Poetry Friday Round-Up being hosted by The Cazzy Files. 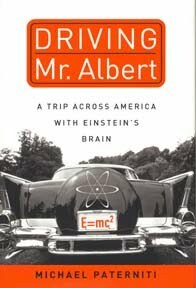 The tale went like this: Einstein died in 1955 and, during an autopsy, his brain was removed from his head, ostensibly to be studied for the keys to its genius. But then, after some years, the brain supposedly disappeared. 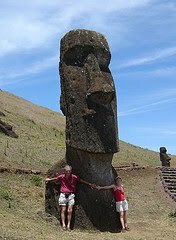 Rumor had it that it had been cut up and parts of it resided somewhere in a garage in Saskatchewan, next to the basketballs and hockey sticks of some oil rigger's kids, collecting dust. Other parts were said to belong to the doctor who did the autopsy, an odd man who had since vanished. If you want to know more, you'll have to read the book! Actually, Michael Paterniti was on NPR's Morning Edition yesterday, so you can listen to him relating the story. Click here. 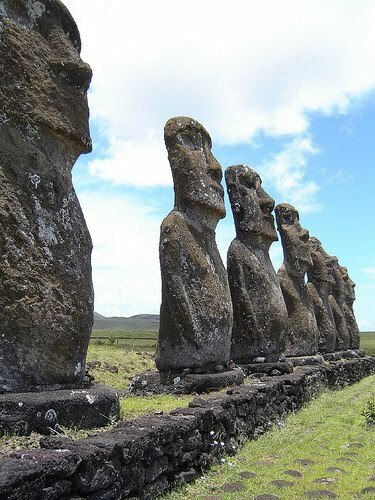 I just read about a group of scientists who think they have unraveled the "secrets of Easter Island." The statues, called moai, are pretty impressive, but, when you see them next to something else so that you can judge actual size, their impressiveness increases tenfold! This is Strawberry Festival and Book Sale time! The big shindig (the 27th annual) takes place this Saturday on the grounds of the library (books will be sold both inside and outside). For a complete schedule of the day's events, click here. There will be a special preview sale of books for FLOW members (and educators and seniors) on Thursday from 4 to 7 pm. Raffle baskets galore are on display now at the Library--there's something for everyone! Some say the best part of the day is the strawberry shortcake--YUM! There will be plenty on hand. The strawberries have been really good this year! 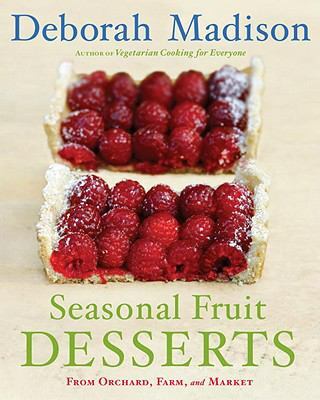 On our shelves we have books on fresh fruit desserts if you want to take advantage of this year's strawberry crop. Here are two: Ripe for Dessert: 100 Outstanding Desserts with Fruit--Inside, Outside, and Alongside by David Lebovitz [641.86 LEB] and, new for 2010, Seasonal Fruit Desserts: From Orchard, Farm, and Market by Deborah Madison [641.86 MAD].